Excellent 2 owner El Camino. Current 73 year old owner bought this El Camino from his friend, the original owner, about 5 years ago. 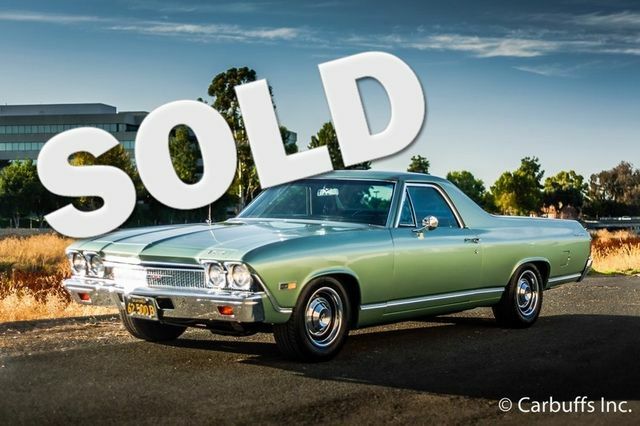 The car was purchased in 1968 from the Chevy dealership in Oakland by original owner and wife.. Before he purchased it the original owner removed the column shift 3 speed manual and installed a floor mount Muncie 4 speed with a Hurst shifter. He also had the 307 rebuilt by Morgan Machine in Walnut Creek, Ca. The engine is .030 over with an RV cam, Edelbrock intake and 4 bbl carburetor, rebuilt heads and Sanderson headers. Runs and sounds great with plenty of power. When the current owner got the car he went about making it look as good as it runs. An expensive complete paint job 2 years ago in the original color of Grecian green was in order as well as all new stainless and chrome. The interior was redone by Freddie at Concord Auto Upholstery in a black vinyl with black suede inserts and a suede headliner. But before the interior work took place everything inside was covered in Dynamat for heat and sound insulation. A custom AM/FM/CD stereo was installed in the glovebox. The front suspension was rebuilt and the car was ready to go. This is just a neat El Camino the the current owner has known since new. Original black plates. Runs and drives great. Only being sold because it doesn’t get used enough. Definitely more money invested that the asking price. True miles unknown.